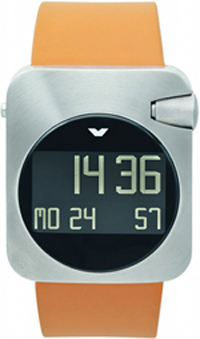 The Swiss company Ventura, proven in the world watch industry as a manufacturer of high-tech digital clock, a new model watch V-TEC Gamma-based multi-function module. The rectangular building new length 41.8 mm and a width of 36.5 mm is made of hard alloy Durinox. The corners of the body somewhat rounded, which gives it the softness and smoothness. The case is waterproof to 50 meters. On the front of the building is equipped with a sapphire crystal. Using a patented recessed head EasySkroll, located on the body, you can scroll the image on the digital display. New V-TEC Gamma operates on the basis of a digital multi-function module VEN10 Swiss production. The module provides a backlit display features the time, countdown timer, perpetual calendar with date, alarm clock, day in five languages, year, month and chronograph function. The module also provides the ability to install 12/24h time display and date display three options. 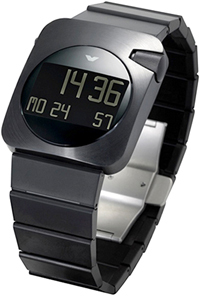 New V-TEC Gamma is supplied to the rubber strap or steel bracelet. You can buy watches from authorized representatives of the company at a price of Ventura in 1350 dollars.